Atlantis is outfitted with two permanently installed hydraulic marine cranes and one portable, foldable utility crane. The two North American MCS 1565-NO cranes are identical in every respect except that the Main Deck crane is equipped with a sheave train to handle the traction winch wire. These cranes are situated so as to serve the entire scientific working area in the after part of the ship, from the flying bridge to the stern. 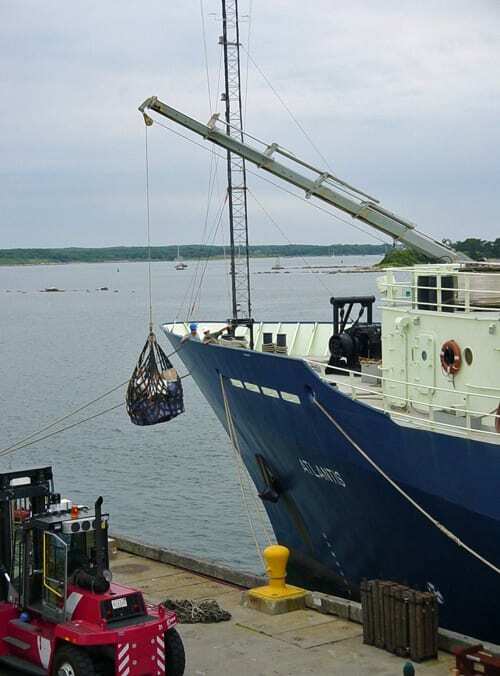 There is adequate reach overboard for instrument handling and loading from a dock. Both cranes are totally self-contained with the electrical controller, hydraulic power packs and operator station mounted on the crane. The cranes are operated by the ship’s crew. This crane has the same capacity and operating limits as the trawl (Main Deck) crane. The crane is mounted on the 01 Deck in the midship section, port side. This location allows the crane to reach the entire midship body of the ship, hatches to internal storage areas and the dock. Its primary function is to load/unload the ship and to move gear around on deck. The crane is mounted on a pedestal which raises all moving components well off the deck with a 7.5-foot vertical clearance. This crane is located on the starboard quarter of the fantail in a position which allows loads to be handled on the fantail and over the stern or side. 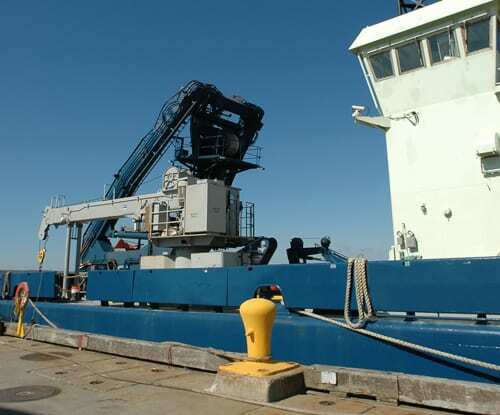 As noted above, this crane is equipped with a sheave train which allows the passage of the trawl wire from the winch below decks to an overboarding block permanently mounted on the main shipper boom. Instruments are picked up from storage areas on the fantail, swung overboard, and lowered directly from the crane. When used in this manner, the crane is housed in a boom crutch for added safety, strength and the relief of stresses on the hydraulic system. The crane is fitted with one fixed boom (main shipper) and two extendible booms (crowds). The crane is mounted on a tubular pedestal which raises all moving components well off the deck with an 8-foot vertical clearance. The working reach of the crane ranges from 6 to 70 feet over a full 360-degree arc. The load ratings depend on the radius from the center of rotation; lift capacity is 42,000 lbs. Use of the crane at sea is limited primarily by the strength of the slewing or rotating mechanism. The slewing mechanism inherently cannot withstand side loading caused by towing instruments or by the roll of the ship. There are no rigid guidelines for the use of the crane in that regard, but in general, side loading producing a torque of 60,000 ft-lbs. (2,000 lbs. at a 30 ft. radius or equivalent) should be avoided. At sea, limits on crane use are normally set by common sense and the practice of good seamanship. The ship carries a small portable HIAB crane which can be positioned on deck as required by individual science programs. The crane is an articulated, totally self-contained hydraulic unit. It's purpose is to assist in handling bulky or heavy scientific gear on deck. Because the crane is articulated, load motion due to pendulum effect can be minimized and the crane can reach below it's base. The crane is mounted on a steel baseplate which can be easily bolted down using the deck tie-downs. 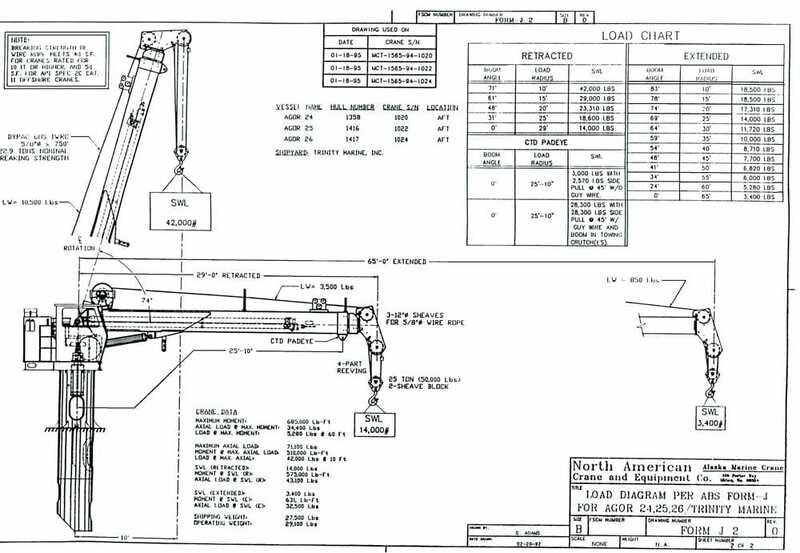 The practical working reach of the crane ranges from 4 to 26 feet over a full 360-degree arc. The load rating depends on the radius from the center of rotation; fully extended lift capacity is 2,205 lbs. The slewing mechanism cannot withstand side loading caused by towing or pulling of instruments or by the roll of the ship. As with all cranes there are no rigid guidelines for the use of the HIAB crane in this regard, but in general, side loading should be avoided. At sea, limits on crane use are normally set by common sense and the practice of good seamanship.